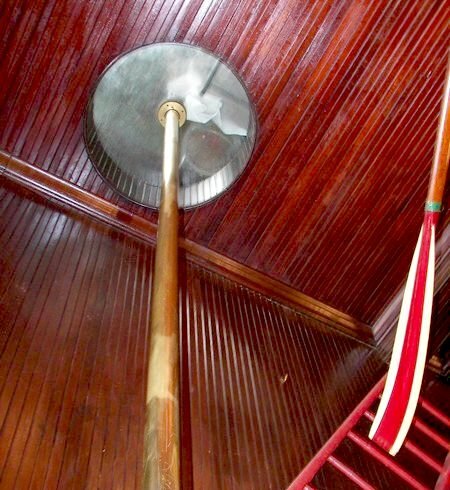 A much favored perch over the years was the front corner stool below the racing scull that hung at Gleason’s Public House in New York City. 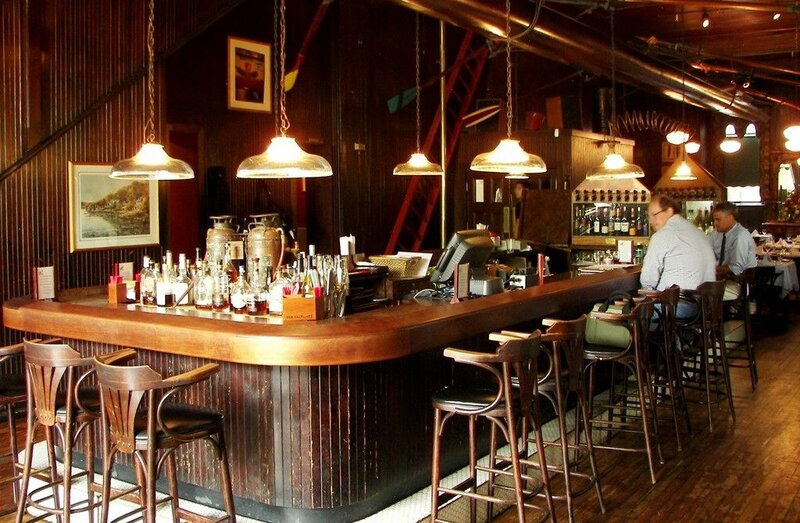 This wonderful bar on the Upper West Side across from the American Museum of Natural History offered one of the most peaceful settings on the entire island. Even though the remains of the Jurassic period reptiles that terrorized my childhood imagination lurked behind the massive stone walls of the imposing edifice on the other side of Columbus Avenue, the decorum and civility required of the living that roamed its cavernous halls seemed to spill out into the surrounding neighborhood. 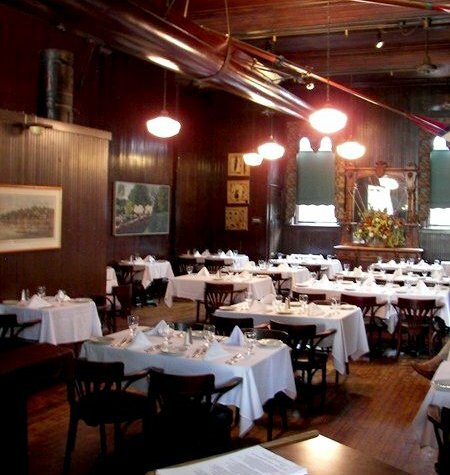 Regrettably, Gleason’s closed its doors many years ago, the victim of either an upturn or a downturn in the economy. 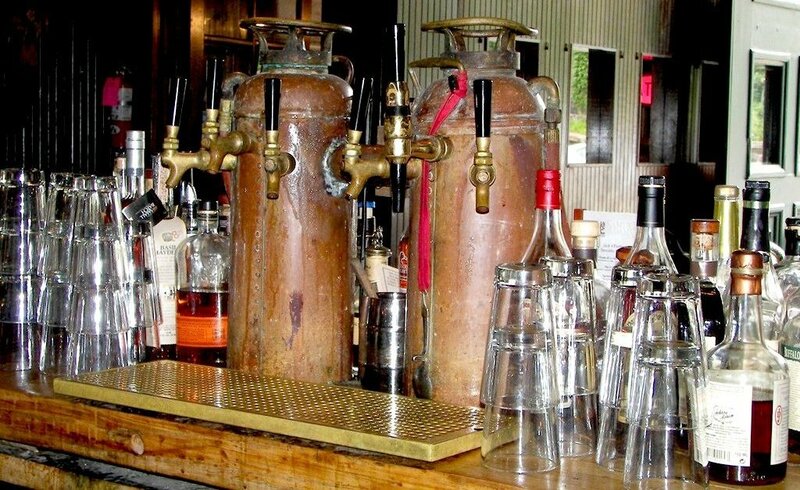 In that city on the Hudson, either force can bring about the demise of good neighborhood tavern. A recent visit to another city on another river would reignite fond forgotten memories of Manhattan. After a late morning tour of Philadelphia’s Eastern State Penitentiary, myself and fellow magazine staffers, John West and Ed Petersen, decided to grab a pre-noon pint at one of the nearby watering holes here in the Fairmount section of Philly. 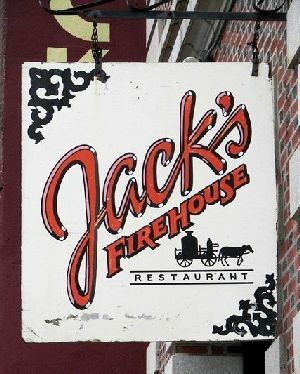 Even if JACK'S FIREHOUSE wasn’t just a stone’s throw from the prison’s front gate, I would have gravitated to this friendly old building. What male child of any age doesn’t want to gain access to a firehouse, especially if that affable guardian of the neighborhood has been turned into a fine pub and restaurant? THE J. RICHARD JORDAN, A SWEEP BOAT WAS FOUND STORED IN THE OLD FIREHOUSE WHEN IT WAS PURCHASED. 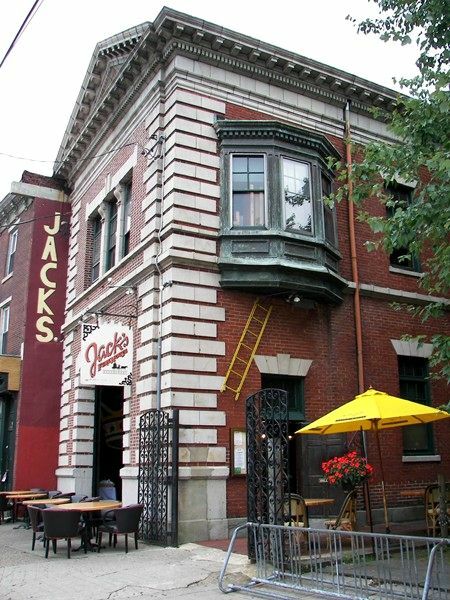 JACK'S IS NOT FAR FROM PHILLY'S BOAT HOUSE ROW WHICH IS A FAMOUS AND REVERED QUEUE OF STYLISH, HISTORIC BUILDINGS RIGHT ON THE SCHUYLKILL (SKOO-KIL) RIVER DEDICATED TO THE SPORT OF ROWING. 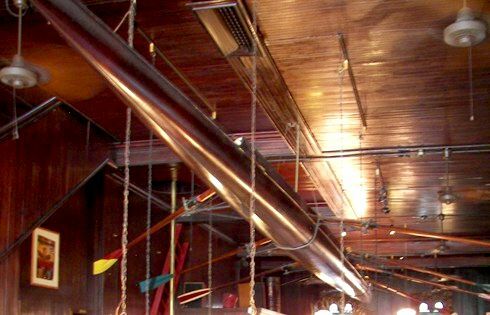 Upon entering, I immediately caught sight of the impressive wooden sweep boat suspended above this absolutely resplendent bar. I quickly commandeered a comfortable stool alongside what is certainly one of the most unique draft towers anywhere. 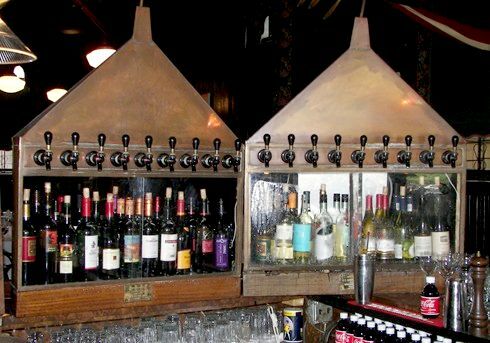 The outstanding selection of local and regional beers that flow from these taps will extinguish any doubts one might have about the capabilities of Pennsylvania brewers. Sipping my Sly Fox Rt. 113 IPA, I watch passers-by slowly walking the length of the foreboding grey walls across the way. Recollections of those blissful afternoons from a long time ago began to emerge from my consciousness. Although there are no traces of those ancient, terrible lizards beyond the courses of quarried Wissahickon schist and gneiss, the vestiges and possible ghosts of the menacing creatures of the current epoch continue to linger. 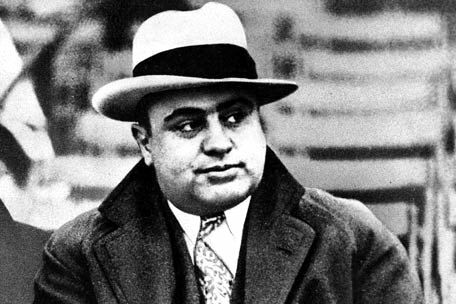 Instead of the bleached bones of Albertosauarus one can view the Oriental rug in the comfy cell of one Alphonse “Scarface” Capone. 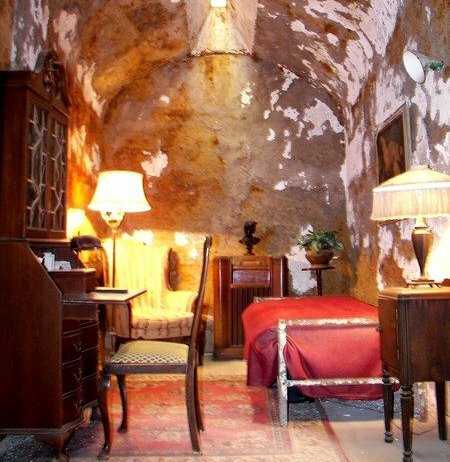 Like New York’s Museum of Natural History, Eastern State Penitentiary influences the pace and character of this part of the city. For much of their parallel existence through the nineteenth and twentieth century the firehouse and prison were at cross purposes. One housed men who were dedicated to the protection of life and property, while the other confined those who had a very different point of view on the matter. Today both structures compliment each other, and are part of the balance and harmony of the neighborhood. Both serve to entertain as well as to educate their visitors about Philadelphia’s rich history. The only differences being the accommodations at JACK'S FIREHOUSE are much more comfortable . . . you can also get some really good food . . . oh yeah, and did I mention the extraordinary beer? For me it’s the firehouse over the big house and the pub over the prison - every time! THE DESCRIPTIVE TERM, "CASUAL ELEGANCE" IS PERHAPS OVERUSED, BUT IT SUITS THIS WARM, WOODEN DINING ROOM TO A TEE.